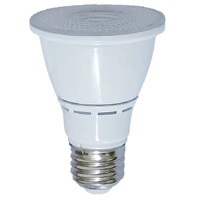 Green Watt 7W Dimmable PAR20 27K 40Deg GL2-PAR-7W-27K-40D has a wattage of 7 with a color temperature of 2700 and an initial lumens of 500. The bulb is dimmable with an angle of 40 degrees. The case quantity is 24.